Precious metals tumbled in February. 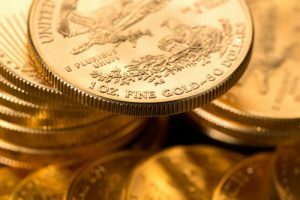 Sales of U.S. Mint bullion coins also slowed. Gold futures declined for a second day in a row Wednesday, and logged their first monthly loss since October. Gold for April delivery dipped 70 cents, or about 0.05%, to settle at $1,317.90 an ounce on the Comex division of the New York Mercantile Exchange. The close is the weakest since Feb. 9. "Even though the dollar is stronger and Treasury yields are higher, the gold market oversold itself yesterday," said Walter Pehowich, executive vice president of investment services at Dillon Gage Metals. Gold futures dropped 1.1% on Tuesday and they edged up 0.2% on Monday. The yellow metal traded 1.9% lower in February after three monthly increases had lifted prices by a combined 5.7%. Gold is 0.7% higher on the year so far. Elsewhere, silver for May delivery declined 2.7 cents, or nearly 0.2%, to finish at $16.407 an ounce. Silver futures sank 4.8% in February following two monthly gains of 0.6% in January and 4.1% in December. They are down on the year by 4.3%. April platinum rose $3.50, or 0.4%, to $988.10 an ounce, but fell 1.6% in February. Palladium for June delivery gained $8.35, or 0.8%, to $1,037.60 an ounce, for a 1.4% monthly increase. The two are divided on the year to date with platinum 5.3% higher and palladium 2.2% lower. Gold declined $7.90, or 0.6%, to $1,317.85 an ounce. Silver fell 17 cents, or 1%, to $16.44 an ounce. Platinum lost $15, or 1.5%, to $979 an ounce. Palladium declined $21, or 2%, to $1,041 an ounce. As for February in LBMA prices, losses reached 2% for gold, 4.6% for silver, 2.4% for platinum and 1% for palladium. American Eagle gold coins totaled to only 5,500 ounces, falling 90.6% from the 58,500 ounces sold in January and dropping 80% from February 2017 when sales reached 27,500 ounces. For the year so far, Gold Eagle sales at 64,000 ounces are 56% lower than the 145,500 ounces delivered during the first two months of last year. American Eagle silver coins totaled 942,500, down 70.9% from the January total of 3,235,000 and off 22.4% from the 1,215,000 ounces moved in February of last year. 2018 Silver Eagle sales at 4,177,500 are 34.1% lower than the 6,342,500 coins sold through the same time in 2017. American Buffalo gold coins moved up by 2,500 ounces, marking declines of 89.6% from January sales of 24,000 ounces and 83.3% from the 15,000 ounces delivered in February 2017. Year to date sales at 26,500 ounces are 43.6% lower than the 47,000 ounces sold during the same two months of a year earlier. American Eagle platinum coins reached 20,000, matching the amount that the U.S. Mint produced for sale in years 2016 and 2017. America the Beautiful Five Ounce Silver Bullion Coins rose by 20,000 coins or 100,000 ounces. All sales came from the Michigan’s Pictured Rocks National Lakeshore silver coin. It launched this past Monday, Feb. 26, as the first 5 ounce release of this year. Last year’s first 5 ounce coin, depicting Effigy Mounds National Monument in Iowa, debuted on Feb. 6 and achieved February sales of 19,500 coins or 97,500 ounces. Below is a sales breakdown of U.S. bullion products with columns listing the number of coins sold during varying periods. Wow…not buying gold…? What’s behind that? I followed one of the more pertinent links in today’s newsletter, and at its destination one of the possible answers to the question of why the interest in gold has diminished is that so much of the investor interest – and thus of course also their money – is now in the process of being transferred over to cobalt and lithium (the essential electric car battery elements), the fast growing field of cannabis (pun intended), and in spite of their recent decline in value, cryptocurrencies. The platinum group metals are taking a major beating down this morning. Amazing! Happy coin collecting & metals investing everyone! Precious metals appear to be involved in a regular game of whack a mole, as there seems to be hardly a break between when one or another of them is getting hit, and hit hard. This is the precious metals game and we all know how to play it….buy low / sell high – stack and safe for retirement. Gold and silver will always be an international form of recognized and accepted currency / let the other precious metal prices ride / short / long term value be dictated by their use in the manufacturing industries. I have not nor will I purchase Platinum or Palladium – not my bag. To each his or her own I always say…and lets see someone purchase a bowl of Pho (just an example lol) in Cambodia with a piece of Platinum or Palladium lol. Come to think of it, I didn’t see any platinum or palladium metals handed out at the Winter Olympics either! Or cobalt and lithium either. Old Collector – I never even thought about Olympic medals – very insightful. Gold, silver and bronze – internationally known and our historical start to modern currency – foundation. Oops, a slight correction is required here to my previous post. The Olympic Bronze Medal is in fact made of 90% copper and 10% tin, not zinc as I erroneously stated. Sorry about that. Jumpin jehosaphat, egads and gadzooks; pray tell exactly where are my brains these days? I just spotted a major error in my post regarding the composition of the Olympic medals, in this case specifically the GOLD one. The “ingredients” of said item do not in fact include “9.99 silver” but rather “99.9 silver”. Mea culpa, carpe diem and namaste.